This is my last post before the holiday break, and I’d like to thank all of you who have visited Invitation Crush during the first few months since it launched. I’m excited about what’s to come in 2011, and I’ll see you back in January, when I’ll be sharing many more awesome invites! Happy Holidays, and here’s to a happy, healthy 2011! Several style trends started to come to the forefront as 2010 went along, and I think that their influence will only grow throughout 2011. A few of these styles have threads connecting them. For example, I think that patterns will explode in popularity in 2011, at least in part, as a result of the trend in designs influenced by both early 20th century and mid-century style. And I believe that the majority of the predictions that I’ll be sharing represent an overall trend in revisiting the past and getting back to more personal, meaningful ways of creative expression. This was a HOT trend in 2010, and I think it will continue through 2011. 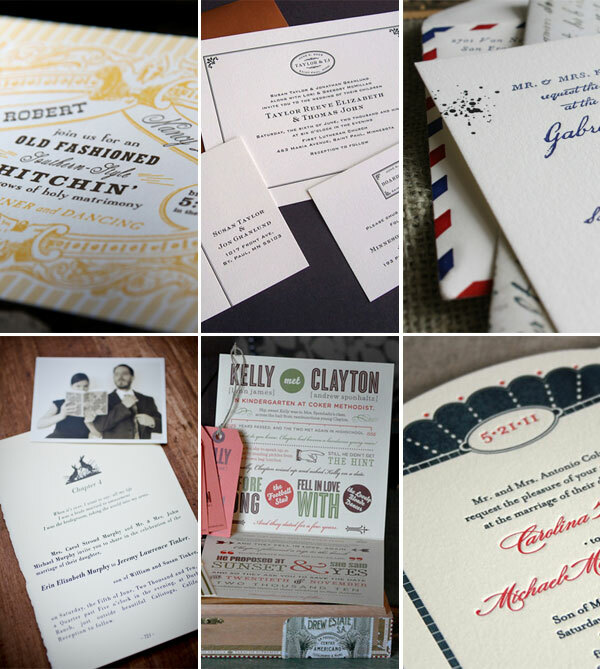 Airmail, old school playbills, telegrams, late 19th and early 20th century ephemera, and posters from the Old West served as the inspiration for some of the most beautiful, original wedding invites of 2010, and I can’t wait to see what’s to come in 2011. I think that we’ll also start to see designers taking more inspiration from the typography, layout, and illustration in vintage books. This is one of my personal favorites, and I’ve already seen signs in design competitions and 2011 line previews that lead me to believe that mid-century-inspired designs are going to explode in 2011. Flags + banners, burst medallions, great typography, and whimsical illustrations will be well represented. 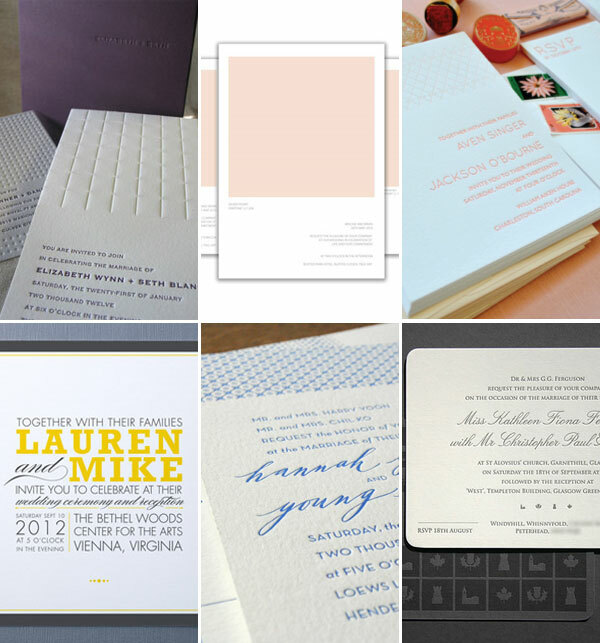 One and two color designs with sleek typography and understated patterns and emblems are a perfect match for the art of letterpress, which offers additional dimension through luxe papers and its trademark tactile appeal. 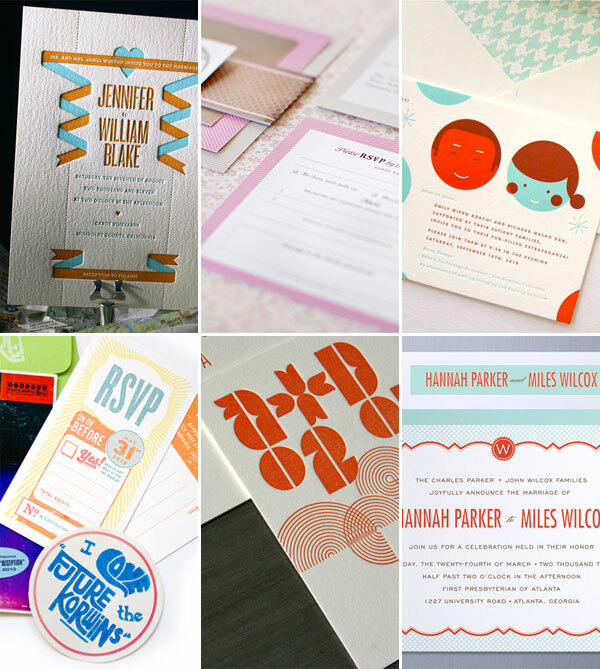 But clean, modern designs will gain popularity in the non-letterpress arena, too, as couples search for options that are both beautiful and subtle. 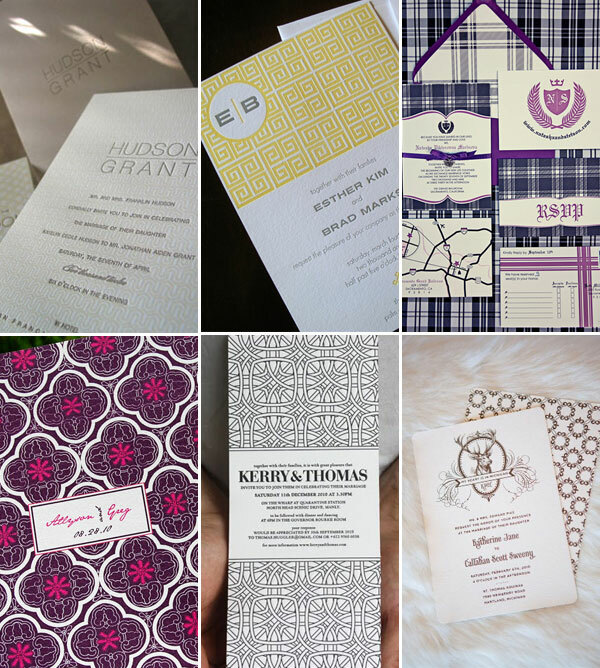 I’ve already touched on pattern’s increasing popularity, particularly in talking about the trend in patterned envelope liner designs, but we’ll be seeing pattern in all shapes and forms in 2011 – herringbone, diagonal stripes, plaid, houndstooth, chevron, used as everything from the main graphic element to the embellishment for the cover of storybook style invitations to the decoration on the reverse of the main invitation. 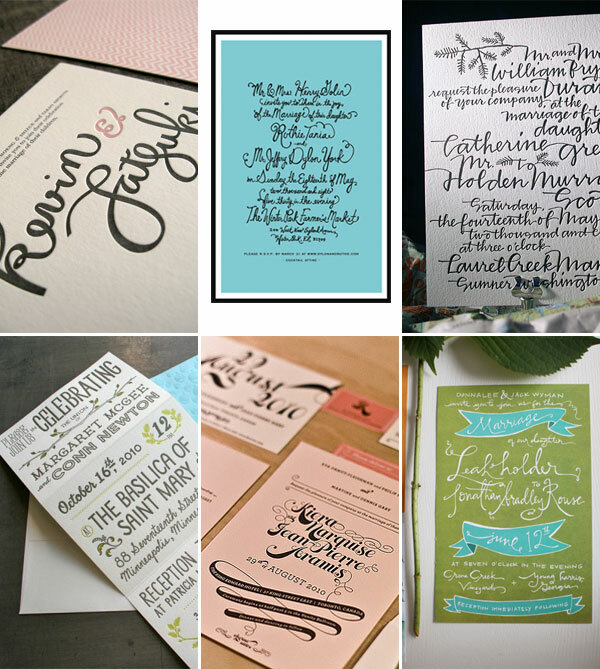 Hand-lettering and calligraphy can add anything from whimsy to elegance, depending on the style chosen. And more great calligraphy and handwritten fonts are coming out, too, which means that designers who don’t specialize in these disciplines can still create invitations with a hand-lettered or hand calligraphed look. I think that we’ll see a mix of both hand-lettering + calligraphy and calligraphy style typography used as the main visual element that carries throughout wedding invitation suites. 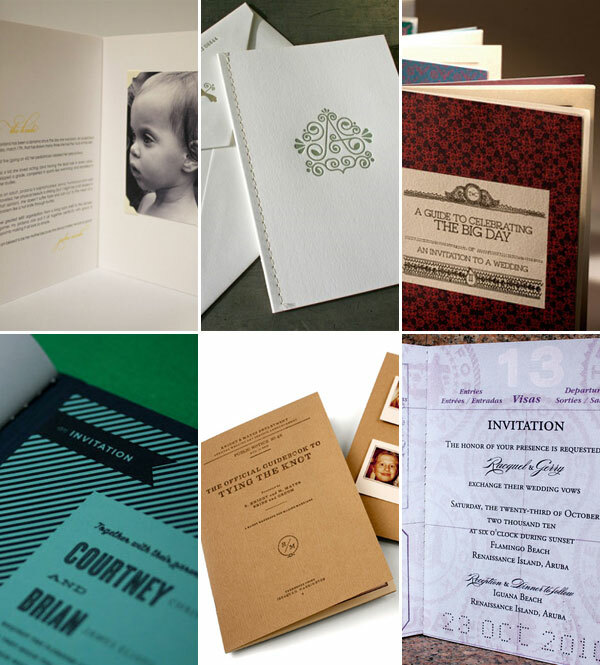 Guidebooks, storybooks, booklets, passports – storybook style wedding invitations allow the couple to tell their story and/or give guests information, usually in a clever and often funny way. 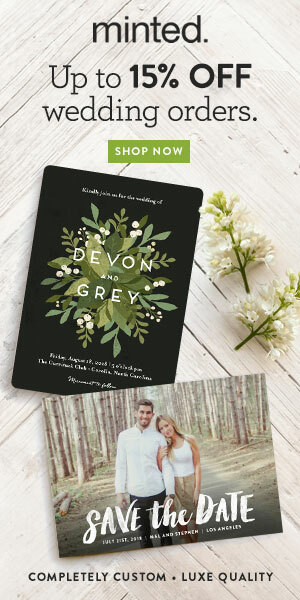 It’s like designing a little book that you can fill with whatever you’d like, and I can understand the appeal of these types of invites, which I think we’ll be seeing more of in 2011.